December, SASO is formed at the conference held in Marianhill, Natal. The conference was exclusively attended by Black students. 1 July, SASO is officially inaugurated at the Turfloop campus of the University of the North (UNIN) with Steve Bantu Biko as its first President and Barney Pityana as Secretary. July, The first General Council (GC) of SASO is held in Natal. SASO Policy Manifesto sets out the Black Consciousness doctrine. Themba Sono was elected president of the South African Student Organisation (SASO). He was also co-founder of the Black People's Convention in 1971 which many people refer to as the adult wing of SASO. SASO General Student Council is held in Hammanskraal. Students protest after the Student Representative Council (SRC) President, Onkgopotse Abram Tiro, is expelled from the UNIN. May, E Isaacs, the SRC President at the University of the Western Cape (UWC) and the subsequent chairman of SASO is expelled from campus after forming a Student Representative Council (SRC) that was not recognised by the University Authorities. 3 July, The president of SASO Themba Sono is expelled from the organisation because he called for the usage of separate development platforms to advance the liberation struggle. July, SASO leaders and representatives from some twenty-seven black organizations establish the Black People Convention as its mother body and inaugurated it in December of the same year. Winnie Kgware was elected its first president with Drake Koka as its Secretary-General. 26 February, The Minister of Justice, Mr. Pelser, issues a five year banning order to eight SASO leaders. SASO is listed as one of the affected organisation under the Affected Organisation Act of 1974. This prohibited it from receiving foreign funding to pursue its objectives. 25 September, The Pro-FRELIMO rally is held at the UNIN despite the administration’s refusal to grant permission for the rally. The rally was to celebrate the ascension of FRELIMO (Mozambican liberation movement under the leadership of Samora Machel) into power in Mozambique. Eighty SASO/BPC leaders are detained without trial for encouraging disorder at the time of the Frelimo-support rallies. The UNIN administration bans SASO from its campus for the mass student protests experienced at the campus and at other University campuses around the country. The Trail of SASO and BPC leaders commences in the Pretoria Supreme Court. Amongst them were Mosioua Lekota, Barney Pityana, Mweni Musa, Nkwenkwe Nkomo and Maitshe Mokoape. July, SASO holds its annual conference under very difficult conditions. It is reported that there is only one member of the executive committee at the meeting. The rest of the executive members were either banned or had been arrested. The SASO and BPC leaders are convicted and jailed on Robben Island (see above 1975 entry). 16 June, The Student Uprisings erupt as a result of the enforcement of Afrikaans as a medium of instruction in Black schools. 11 September, Biko is transferred to Pretoria. He was driven naked and chained lying on the floor of the Land Rover van for 740 miles to Pretoria with nothing to eat except a container of water, at this stage he had already suffered severe head and brain injuries. 12 September, Biko dies in detention in Pretoria Central Prison. 19 October, SASO and other BC organisations are banned under the Internal Security Act. The Azanian Students’ Organisation (AZASO) is formed under Tom Nkoana and organises students in the tertiary education sector. AZASO is officially launched to fill the vacuum left by SASO after it was banned. AZASO under the new leadership of Joe Phaahla embraces the Freedom Charter as its guiding document on education, especially the clause stating that "The doors of learning and culture shall be opened". It was the adoption of ANC policies and the Freedom Charter that set AZASO apart from SASO. 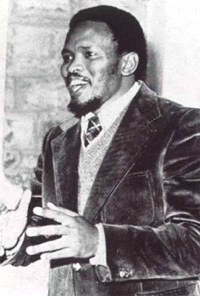 SASO’s Policy Manifesto included and emphasized the Black Consciousness doctrine. AZASO-Congress Of South African Student (COSAS) lead Anti-Republic Day protests together. read more about Republic Day. December, AZASO president Joe Phaahla addresses the NUSAS National Congress held in Cape Town. AZASO-COSAS begin the Education Charter campaign to collect the demands of the oppressed in the sphere of education. AZASO holds Anti-constitutional reform protests. July, AZASO’s second congress proposes the Education Charter Campaign. July, AZASO Congress passes a resolution on the Education Charter. That regional councils of AZASO assume responsibility for the creation of Education Charter committees within all branches. That an intensive national campaign be launched later in the year to popularize the concept of the Education Charter of the people. COSAS and AZASO call a countrywide day of solidarity within all schools, universities and colleges. SANSCO is restricted under the State of Emergency. 6 September, SANSCO and NUSAS merge to form South African Student Congress (SASCO) at Rhodes University in Grahamstown, Eastern Cape.